During the past week, Station 52 has been involved with 2 Animal rescues from open air liquid manure pits within our Fire District. Incidents of this type are extremely challenging each and every time, with injury risks not only for the animal , but also to our first responders. In both rescues crews were able to maneuver the animals to the edge utilizing rope techniques. After a brief rest period for the animal, crews begin to utilize lifting straps to hoist the animal up and out of the pit. 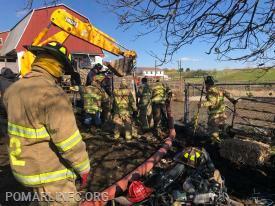 In both situations a front end loader from Sadsbury Township, Lancaster County was used in the extraction. Both rescues had a successful outcome. This was a great job by all involved. Christiana Fire Company would like to thank our mutual aid partners ; Station 51 ( Bart Fire Company ) Station 36 ( Po-Mar -Lin Fire Company- Chester County )for their LAR Unit ( Large Animal Rescue ) and Sadsbury Township.